I reach for a stone to drop down the well to check where the water level is. The one I pick up is covered with seashell fossils from when these Ozark Mountains were under oceans millennium ago. I place it in my satchel to add to the others I’ve collected. It always amazes me that here, in the middle of the United States, there was once ocean. Finding another plain stone, I drop it and listen. No ‘splash’ of stone hitting water, but instead, the sound of ‘plop’ onto dirt. OK, not a well but a tunnel as the stair-ladder indicates. What else will I find? Fixing the flashlight to attach to the side of my neck with the bandana I always carry and have used in this manner before, I free my hands for going down the narrow pieces of wood. Turning around, I gingerly step backwards and down the first rung, using my arms to balance and thinking perhaps, I should get down on all fours and ease down. I am no longer as agile as I once was. I decide to use an overhanging branch as leverage to step down the second rung, then the third and fourth as I check for dry rot on each. At last my hands can grab the wooden steps, trying to avoid splinters. Finally my head drops below the level of the surface. The flashlight shines brightly on the close earthen walls. Ouch! What’s that? My right hand gets cut as it moved to gain another purchase on the ladder. An arrowhead! When is this from? I pry it out of the earth and examine at it. As common as they are around here, I still thrill to unearth one. Is it Osage, Caddo or Cherokee? Hard to tell. Could be from the very early days when many of the American Indian tribes criss-crossed this area either for hunting grounds or summer camps in the hills. Or maybe from the Trail of Tears, or “the trail where they cried”, which passed through this area as over 1,000 Cherokees led by John Benge trudged through here in January of 1839. I’ll put this into my satchel to check out later when I get back. Finally I reach bottom. I detach my flashlight from its cloth holder so I can maneuver the light better. I fold up and place the bandana back into the satchel, then look around. I’m standing in a dead-end of a tunnel that appears to slant downward from here. Do I dare go further? I’m intrigued by all the recent TV programs on the Manhattan underground and London underground, and all the various tunnels for systems under cities for pipes, electric, water, sewer and subway systems. Even underground cisterns as in Masada and New York City, and underground shelters in Roman times and in London in World War II – all fascinating! Yet this is creepy, too. Where does this lead? What else is down here? I think of all the stuff nightmares are made of: darkness, bugs, spiders, monsters, the unknown. I think I should go back. But what if it’s part of the Underground Railroad? Or an escape route during the Civil War when the North/South line moved back and forth across this area? I decide I’ll walk just a little further. Cautious steps, one after the other, all going down a slight slope. Something skitters nearby, causing me to stop as my heart pounds and I move my flashlight towards the sound. It’s only a salamander. How pretty! It looks like a clown with those black polka dots on a bright orange smooth body. A few more steps and I stop again as I hear another noise, but this sounds like water lapping softly onto the shore. This intensifies as I continue along. Then I step into what appears to be a large cave with a rock ledge running along one side and expanding past a pool of water that is mostly calm but with just enough motion to create the lapping sound. Is water flowing in? I watch, but the water isn’t rising. Maybe it is flowing in and out? Aiming the light so it follows the ledge out over the pool, I see some things piled there. I climb up and walk out further a bit on the solid ledge. An old bashed-in tin cup, maybe for getting pool water to drink? Someone hiding out waiting to connect up with the Butterfield Stagecoach, which passed nearby? Back here, near the rock wall, a pile of feathers interspersed with bits of disintegrating cloth… no, it’s burlap sacking. Maybe this had been someone’s sleeping pallet… for a slave dreaming of freedom? for a soldier dreaming of peace? for a settler dreaming of escape? And of what do I dream as I stand here in this tunnel of history? Of the interconnectiveness of all things, the ebb and flow of life, the weaving of patterns, the wonder of it all. But mostly, of the even bigger Wonder beyond it all! My reverie finally breaks. A little further along the ledge, I see a pile of charred wood and something half buried in the ashes. How long ago was this fire snapping and crackling? What’s this? A partially burned wooden carved fish! Symbol of Christians being here? Fisherman? Fish in the water? I go to the edge and peer into the deeper part of the pool. Yes, I see fish swimming, but they seem to be moving with a purpose, as a school of fish, from left to right. Is that how the current flows? I watch closely. Yes, it is. Yet I don’t see an opening into the cave. Must be underwater. I’m not a very good swimmer. I think I’ll turn back. This has been adventure enough and gives me plenty to write about. But where are these fish going? 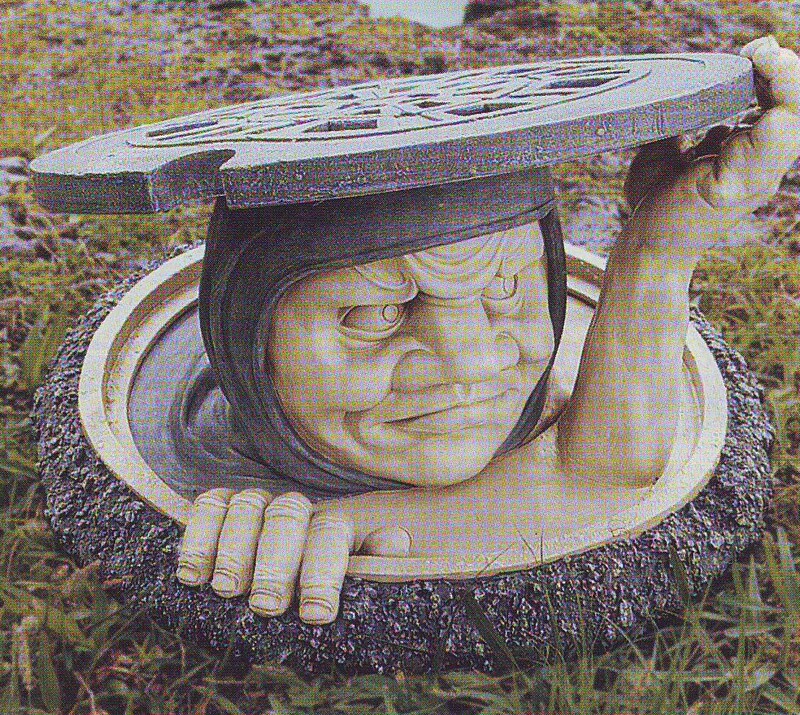 I finished glancing through a Toscano catalog, enjoying all the beautiful sculptures suitable for putting in the garden. Most everything was too expensive for me to ever buy, but just looking always inspired me with garden ideas more suitable for my budget. So I then decide to wander through the garden, as the various possibilities were still fresh. I wander through the flower and vegetable gardens, around the huge wild rose bush in bloom, past the honeysuckle overgrowing the old fence, and roam through the back gate onto the rest of the property, all wild and abandoned. Clumps of daisies and cluster of late-blooming daffodils poke through wild grasses and tumbled stone, evidence of caring habitation in the old homestead that had been here years ago. Part of the local stone chimney was evident, now a haven for snakes and other critters. Giving the chimney a wide berth, I move behind it toward a particularly beautiful setting of blackberry flowers cascading on prolific branches. They seem to form a circle with an opening in the center, but as I walk around the perimeter, I’m not able to penetrate within. Something smaller was needed to avoid all the thorns… Yes, a bee. I shoot straight to the center and see a round wooden plank cover lying there, encrusted with moss in places. A metal handle pokes out of the center, so I shift back into my overweight self and pick up the satchel. As I glance around I think back to the catalogue I had just seen and remember one of the items for sale entitled “The Dweller Below.” This sculpture by artist Liam Manchester portrayed a legendary boogeyman rising from beneath the streets of London through a manhole cover. The sculpture gave me second thoughts about pulling the cover off, but really, what do boogeymen roaming the city-streets of London have to do with a well in Ozarks country. Grunting, I pull off the cover and peer within, expecting to see water below. Instead, there are stairs leading down into blackness. What is this? Not a water-well which are common around the farms here, but a passageway. Where does it lead? Could this have been an escape route in case of attack from rustlers or Indians way back? How long ago was that homestead here? Maybe it’s more of an escape for during the Civil War when the North and South fought heavily in this area. Part of the underground railway? Where does this lead?